Dr. Watson was a key figure in a project that archived every English book ever written up to the year 1800. This vast archive of work brought him to a first-hand knowledge of theological thought and historical activity in an era that had previously been closed to most researchers. To learn more about this project, click here to read an interview with Dr. Watson. 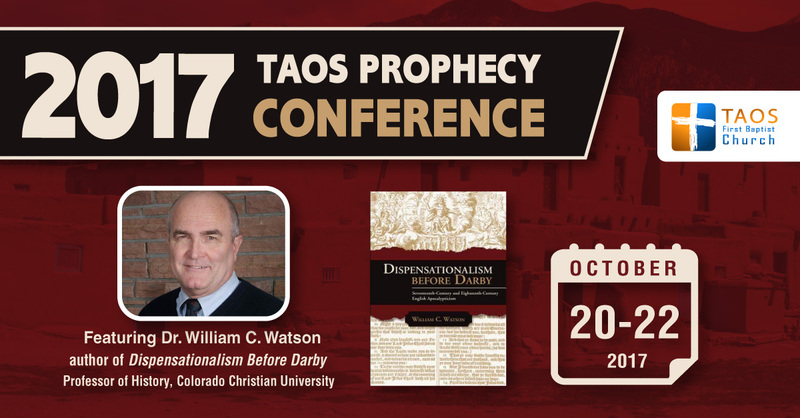 If you love prophecy, you’ll love hearing what previous generations of theologians taught and believed about prophetic events. Dr. Watson is an engaging speaker, as well as informative. He is Professor of History at Colorado Christian University. We hope you’ll take advantage of this free learning opportunity. This is certainly not your typical modern-church “feel-good” seminar, but it will be a thought-filled weekend, filling the mind with valuable information that will help you understand the flow of theological thought from the church fathers through the 19th century. The community is invited to each session. There is no cost to any session. A free-will offering will be taken to provide an honorarium for Dr. Watson and to cover expenses for the weekend. If you are from out of town and would like information on local lodging and tourist opportunities, contact randy@taosfbc.org.